Lobuche Peak is Nepal Himalayas peak, which lies close to Khumbu Glacier. It consists of two different summits Lobuche Far East (6,119m) and Lobuche West (6,145m). A continuous ridge connects them but there is still a sharp gap and a considerable distance between them. 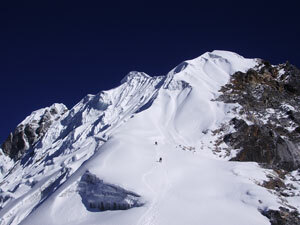 The Far East Peak is recognized as a trekking peak, whereas the West is known as an Expedition Peak. Lobuje being an attractive mountain offers various existing routes and also a potential for new ones. The dark triangle of its rocky Far East face rises over the moraines of the Khumbu Glacier to a spectacular skyline, forming the south ridge. Lobuche Far East is reached by descending a marked notch and climbing steep snowy slopes to the top. On most occasions, the mountain is climbed on the summit ridge only as far as a subsidiary snow summit, south-east of the true peak and before the notch. This peak is identified as the false peak. Laurence Nielson and Ang Gyalzen Sherpa made the first ascent to Lobuche East on 25 April 1984 although there are possibilities that others have reached the summit before. But no records are available. KATHMANDU DURBAR SQUARE is the palace of the Malla and Shah kings who ruled over the city, surrounded with spectacular architecture and vividly showcases the skills of the Newar artists and craftsmen over several centuries. Your day begins early as you head for Kathmandu airport to catch to Lukla flight. Assuming the flight departs without much delay, you will have fine weather with stunning views of Himalayan peaks. The trail leaves Lukla through a Kani or gateway. Soon you are walking down gently descending trails, past rolling farmlands that extends over what seems to be a wide promontory overlooking the canyon of the Dudh Koshi River. The snow peak at the head of the valley is Kumbila (5,716m), the mountain sacred to the Sherpas. On the way to Phakding, you will notice a huge boulder printed with Tibetan religious mantras (mostly; Om Mani Padme Hum). About 3 hours walk, you will be in Phakding. Overnight in Phakding. Day 06: NAMCHE BAZAAR – PHORTSE TENGA (3640m). A very spectacular day in terms of scenery. The main trail out of Namche heads north to Everest. Following this trail, a short climb to a crest reveals a wonderful view towards Everest and Lhotse, whilst nearer at hand our route is a Yak trail, contouring around the hillside. The way to Gokyo is via Phortse Tenga and follows this main trail for a while longer, passing many traders selling Tibetan handicraft, to a crossroads high above the Dudh Koshi (Milk River). The main trail to Everest drops down the hill to Phunki Thanga, whereas our trail climbs to cross the Mon La to reach Phortse Tenga. The Nepal Kingdom Foundation is involved with various projects in this area. An extra night is spent here to see how the community lives and also to further acclimatize. Day 07: PHORTSE – MACHHERMO (4410m, 5hrs). From Phortse Tenga we climb steadily along the side of the valley, Rhododendron forests giving way to scrub juniper as altitude increases. The trail passes many summer settlements (yersa), used when yaks are taken to these pastures to graze in the summer months. Ahead of us are excellent views of Cho Oyu while back down the valley are the peaks of Khantega and Thamserku, both over 21,500ft. / 7481m. Day 08: MACHHERMO – GOKYO LAKE (4750m, 4hrs). The trail climbs steeply after Machhermo, ascending a spur that it rounds and then carries on along the slope to reach Pangka (4550m) and then descend slightly, following one of the melt-water Rivers which flow down the west side of the Ngozumpa Glacier. We climb a steep rocky incline into the ablation valley by the side of the glacier, passing the first of the holy lakes. We soon arrive at the second of the lakes, crossing the path that heads across the glacier to the Cho La. The third lake is known as Dudh Pokhari and on its east shore is the summer settlement of Gokyo (4,791m). Walking by the side of the lake, the scenery is magnificent with the summits of Cho Oyu and Gyachung Kang reflected in its emerald green waters. There are several dwellings, including two lodges that boast solar shower and heating. Day 09: Excursion to GOKYO RI (5357m). We leave camp just after first light, crossing the ablation valley and following a Zig zag path up the hillside. As we climb, Everest, Lhotse and Makalu slowly come into view. From the summit of Gokyo Ri we have one of the finest views of Everest to be had in the Khumbu. Some say it is a finer view than that from Kalapathar, but you will be able to judge for yourself. For those who still have some energy, there are more good views to be had by dropping back down to the main path and following it north to the fourth and fifth of the Gokyo lakes, the latter being about three hours from Gokyo. Today, we head for Lobuche. We climb down from Dzongla. Upon crossing a bridge, we transverse through grassy trail. Enjoying the view of Lobuche Peak we stretch up eventually through a ridge. The mountains of Ama Dablam, Khangtega, Thamserku Taboche are seen looming prominently. Curving round through the wide gravelly river bed, we reach Lobuche. Today is a challenging day but will no doubt be very rewarding and the highlight of the trek. We start early in the morning to catch the dramatic views from Kalapathar witnessing the first light of day shining on Mt. Everest. However, we need to get prepared for an early morning, dark and cold temperature (-10 to -14 C) departure beforehand. Further, there is always the potential of chilly winds which are quite common. Familiar peaks such as Lingtren, Khumbutse, Changtse tower to the east even as Everest begins to reveal itself emerging between the west shoulder crest and Nuptse. During the ascent to Kalapathar we can pause to catch our breath at several outstanding viewpoints to snap pictures. After 2 hours of ascent, we will be Kalapathar. From this juncture, we scramble to climb the rocky outcrop near to the summit marked by cairns and prayer flags. As we reach the top, we sit on the Kalapathar where our eyes rook taking in the unbelievable Himalayan Panorama, wandering from one mighty massif to another. We take as many pictures as we can and take the in view with our mind's eye to last lifetime. After a light lunch we will set off to walk to Everest Base Camp which is approximately 4 to 5 hour return trek back to Gorakshep where we sleep tonight. After crossing the sandy flat at Gorakshep the trail climbs onto the lateral moraine of the Khumbu glacier and ascends the side of the glacier for two hours before finally descending onto rocky glacial moraine. The trail then winds up and down and through fascinating ice sera’s to Everest Base Camp where there are fantastic close up views of the Khumbu ice fall. In spring season this Base Camp will be packed with many nationalities attempting to climb Everest. After a short stop we will retrace our trail back to Gorakshep. On being back to Gorakshep and continue to walk to Lobuche of 2 hours walking. Today, we begin our trek from Lobuche toward the Lobuche Base Camp. After walking some distance on relatively flatter plane, the path to the Lobuche Base Camp gets steeper and rocky. Since, we will be trekking toward somewhat lower altitude today, you may it find it easier for your body. Move forward along the Lobuche Glacier, while enjoying the great views of Ama Dablam, Cholatse, Pokhalde, Thamserku, Khantenga etc. After reaching the Lobuche Base Camp, take rest for some time and make necessary preparation for the summit. After lunch, our guides will provide training on peak climbing techniques and using climbing gears such as ice axe, climbing boot, harness, jummer, and how to go up and down using ropes. There will be training on how to fix the ropes, climbing technique, and about the knot and gears. Some training experience would certainly boost up your confidence and climbing skills thus increasing the chances of scaling the summit as well as fully enjoy the experience. Today, after breakfast we make a hike from Lobuche Base Camp to the Lobuche High Camp. The climb takes for about 4 hours. The High camp is located at 5,600m/18,368 ft. From Base Camp, we hike on a rocky moraine path to reach the high camp. Upon reaching the high camp, we set up our camp, take lunch and rest. You can also walk around for some time that would also help in acclimatization. Today is our cherished day for the summit. We start early in the morning for the summit endeavor. Lobuche east offers more panoramic views of the mountains those other popular peaks such as Island Peak. Once upon the Lobuche summit, you would enjoy magnifiscently panoramic views of Everest, Lhotse, Nuptse, Ama Dablam, Cholatse, Pumori, and many more. We spend some time at the summit celebrating and taking pictures, then we get back to the High Camp again. After taking our morning breakfast, we trek downhill from Lobuche Base Camp and join the Everest Base Camp route at Lobuche again. We take our lunch at Lobuche. From Lobuche we again retrace our path to Pheriche. On the way to Pheriche, enjoy the magnificent views of Mt. Amadablam in the distance. From Pheriche, we continue to Pangboche. Some of the other peaks that you would enjoy include Pokhalde, Thamserku, Kantenga among others. We will trek down through the hillside blanketed by rhododendron and juniper trees. If it's spring, pink and red rhododendron flowers ablaze our surroundings. Upon reaching Pangboche you may also consider visiting the famous Pangoche Monastery. Day 20: NAMCHE BAZAAR – LUKLA (2,850m). From Namche Bazaar the trail descends steeply to the village of Jorsale. Passing the villages of Phakding (2640m) and Choplung, we reach Chaunri Kharka and the trail that cuts up to the airstrip at Lukla. We will camp on the lawn of a lodge at Lukla. Day 21: By domestic Flight: LUKLA – KATHMANDU and transfer to Hotel in Kathmandu. Take flight back to Kathmandu from Lukla after a breakfast. But the flight is depend upon the weather condition and need to wait till evening. Transfer to hotel in Kathmandu and free afternoon. Above mentioned Trip dates are the fixed departure date for Lobuche Peak climbing 2019. The cost mentioned in the tables are the cost from 6 to 12 peoples in a group. This trip can only be organized for minimum of two people upon your request. A group booking of 10 or more people is subjected to a maximum discount with the availability of free trip to one person. If your group is much larger please contact us to discuss about the price.